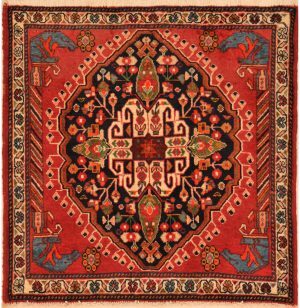 Qashqai rugs are recognized by their bold, graphic designs and their bright, joyful color combinations of madder red, indigo blue and golden-yellow. Although the designs may sometimes tend to be more whimsical, they almost always follow a convention template that has been in use for several generations. 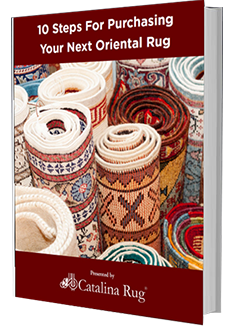 There’s nothing subtle or quiet about the color or designs of Qashqai rugs. The rugs are woven using large amounts of very bold shades of red. Providing a perfect complement to the prominent red are classic yellow and indigo blue. 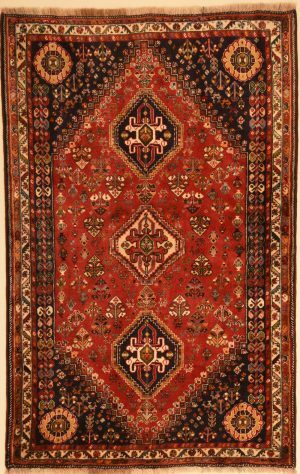 Qashqai rugs have several different types of medallion layouts and this is because of the different origins of the weavers who learnt the different layouts from their families. In one type of layout, the medallions appear shaped as hexagons or regular diamonds. Sometimes they appear as 3 diamonds that are vertically connected. Another common patterns is to have 4 hooks surrounding a small sized diamond or square shaped feature inside the medallion. Sometimes, this square or diamond surrounded by hooks appears in the rug as an all-over pattern. 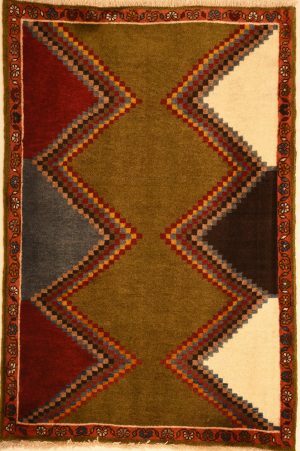 The Qashqai rugs are woven by Qashqai tribeswomen, who came from different ethnic backgrounds including Turkoman, Arabs, Lurs and Kurds. Irrespective of their ethnic or cultural background, these weavers all descended from several generations of skilled weavers who passed their tradition down to their descendants. The rugs are all-wool. 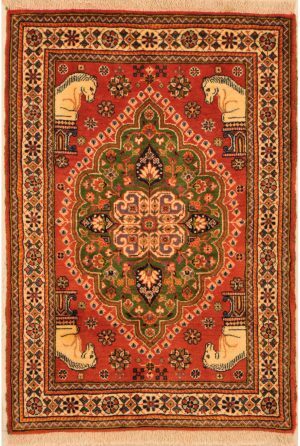 The wool used in weaving traditional Qashqai rugs is usually of superior quality and hard wearing, which shows in the higher quality and longer lasting quality of the finished rug. The carpets are woven having asymmetric knots and the finished piece will usually feature deeply depressed warps with red-dyed wefts and a fine weave. A barber-pole selvage gives the edges a finished look and most rugs will feature a kilim at both ends. 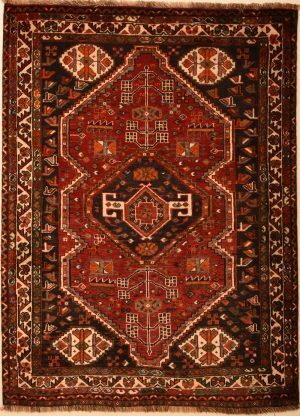 Most rugs made by the Qashqai weavers were medium sized, although you will see them in different sizes too. Qashqai weavers remained staunchly supportive and connected to each other as they set up and dismantled their looms over and over again. In fact, it is not uncommon to see several tribeswomen squatting over one long vertical loom, chatting, singing, laughing and connecting with each other while working on a single rug at a time. Very often, a weaver will move from one loom to another, helping different weavers while catching up with the day’s stories, before returning to her own loom to resume her own weaving. While some weavers are busy with their looms, the other women scour the nearby mountains and countryside in search of barks, berries, herbs and other foliage that they can use to manufacture their dye. This simple lifestyle and the underlying joy and connectedness is reflected in the rugs, which always have a very joyful appearance that can brighten up any space where it is placed.